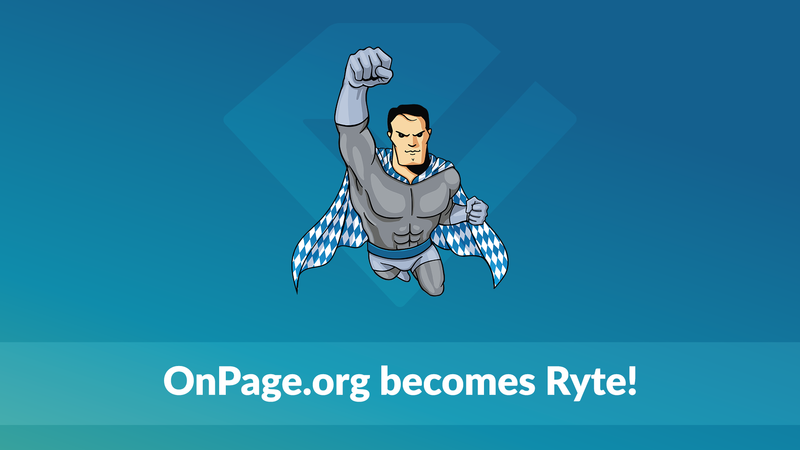 OnPage.org is now Ryte - the Ryte way to your digital success. The 19th of July does not only mark the 5th anniversary of OnPage.org but also the 1st day of Ryte. When we started with OnPage.org, we dreamed of making all websites better. With Ryte, we want to achieve even more: we want to go beyond the page to improve all digital assets. Our dream is bigger than OnPage.org – we want to move beyond websites and offer a simple, but not basic solution for businesses who want to be more successful with their digital assets. Therefore, we needed something larger than our initial brand – especially as we are becoming more international. We will always remain an industry strength crawling solution, but with Ryte, users can leverage their digital businesses and improve their overall performance on the web. We will take users by the hand, give them clear and actionable advice without overwhelming them with tons of data. That is how our new product started to take shape. Ryte consists of three modules in which you can find reports, data and analysis to monitor, analyze and optimize your individual assets. Website Success allows you to ensure the quality of your website for more success online. Ryte monitors the relevant KPIs and technical issues, thereby you can check your website’s performance at a single glance, giving you many opportunities to increase traffic and conversions. Your visibility in search engines is the crux of Search Success. For this purpose, we provide you with real data of your keywords so that you’re able to analyze your rankings and to identify your biggest potentials. Only one thing matters: be the number 1 in search engines. Who has never dreamed of great and unique content which contributes to making your brand prosperous? Content Success allows you to monitor and analyze how your content performs and how keywords should be used in context with your product or brand. Ryte helps you to enhance your content quality and gives you a head start over the competition. Redesigning our product, our tools and our brand has not been an easy process, however these past few months have been the most exciting we have ever had. With Ryte, there will be always more to come, because we are constantly striving for more: we love progress, we love innovation and we love what we are doing. Ryte enables us to go above the limits and to think big. The new version of our software is online now! Published on 07/19/2017 by Irina Hey. Hi, sorry that you’re having problems! Don’t hesitate to contact support@ryte.com, and they will be happy to help.